IT downtime is frustrating and downright maddening since it can so easily be avoided. As a small business owner you can’t afford to lose business and customers because of failed computer systems. That’s why you need to know the different between disaster recovery and business continuity. A lot of business owners erroneously believe that because they have a copy of their data somewhere that they must already have a business continuity plan in place and could be back up and running again fast. That notion is simply not true. First of all, the word “disaster” indicates a situation where business systems are no longer functioning, or where data has been corrupted, lost or otherwise made inaccessible. That could be something as simple as a server experiencing a non-recoverable failure (thereby corrupting or deleting the data on it) or an office building being destroyed by a natural disaster (fires, floods, hurricanes.) It could also be caused by a cyber-attack, for instance a disgruntled employee or any number of other unforeseen, unplanned events. In many cases, if the data wasn’t backed up properly, or if a business continuity system wasn’t put in place, several days or even weeks can go by while data is recovered and IT systems are rebuilt and restored. Essentially, business continuity systems are proactive, where disaster recovery systems are reactive. For example, having a second Internet connection would be part of a good business continuity plan if you’re highly dependent on e-mail and Internet access. If your main Internet provider was out, you’d have a way to keep working uninterrupted. Cloud computing is also often part of a smart business continuity plan. If your data, e-mail, files and applications are hosted in the cloud, employees could continue to work remotely from home or in another location if your office building was destroyed or otherwise inaccessible due to a natural disaster, fire, evacuation, gas leak, etc. These days you have several options to help keep your computers running and your information available 24/7/365. Storage solutions that contain backed-up, redundant hard drives, like Network Attached Storage (NAS) and Storage Area Networks (SAN) storage devices, help you recover in failure situations. Your users never see that a drive failed. Their data and applications are always available, even if if hardware breaks. Many companies don’t have the latest hardware and software installed, however, it’s important to upgrade your systems in order to take advantage of new solutions. You need to have a plan for dealing with natural disasters, hackers, viruses, legal threats and new rules governing data protection. With the Cloud gaining in acceptance, many small businesses have a backup copy of their files at their office and also stream all of their data offsite to a Cloud data backup facility, protecting the company data from any physical disruption at the company office. 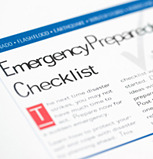 As the Owner, if you are unsure or uneasy of where your company data is regarding backup disaster recovery or from a business continuity perspective, you should download ANP’s five step guide on how to develop and maintain a disaster recovery plan. Or take a more proactive approach and sit in our Disaster Recovery and Business Continuity Webinar scheduled for this month.